Just like that, the cold front snapped NY back into the wintry reality! Soup is the best remedy for this kind of weather, and since we are in the height of Soup Month(s) celebration (Soup Fans: “YAY!! !”), I have created another recipe for us to enjoy! 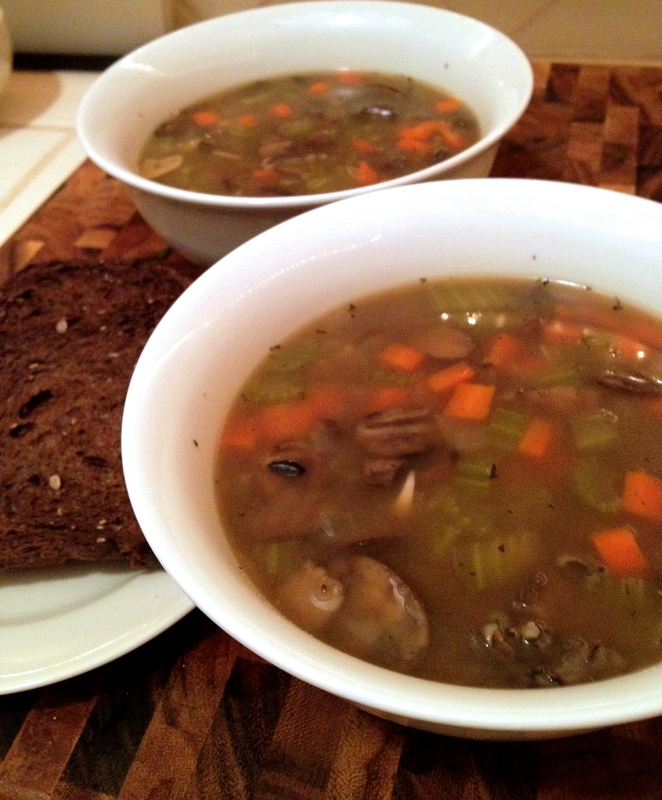 The mushroom and wild rice soup. At first glance, the mix of herbs may seem excessive, but Herbs de Provence, I thought, complimented the amazing fragrance of wild rice and the citrusy notes of coriander balances out the earthy mushrooms very nicely. Try it! – Heat up 1 – 2 tablespoon of olive oil over medium heat in a large stock pot, add chopped onion and minced garlic. Sauté until translucent, about 5 minutes. – Add carrots, celery, and mushrooms, stir with onions and garlic to coat with oil. About 2 – 3 minutes. – Add chicken or vegetable stock to cover carrots, celery, mushrooms, garlic, and onions, and bring to boil. Cover and lower to low-medium heat, and let simmer for 30 – 40 minutes until carrots are relatively soft. – Then, add wild rice and simmer for another 40 minutes or until everything is cook through and tender. – Season with Salt, Pepper, Coriander, and Herbs de Provence. Check out last week’s Broccoli and Potato soup for more vegetarian soup options! If you want something even heartier, you can get the Italian Sausage Tortellini soup recipe here.